See Branch Warren finally have his big day in the sun at the Arnold Classic as he takes a thoroughly deserved victory. Nicole Nagrani is the inaugural winner of the Bikini International contest from a star studded field. Branch Warren triumphs over sensational Dennis Wolf and former winner Victor Martinez, while huge Evan Centopani makes a stunning entry into the first comparison call-out to the delight of the fans! The stars are Branch Warren (1), Dennis Wolf (2), Victor Martinez (3), Evan Centopani (4), Dexter Jackson (5), Ronny Rockel (6), Johnnie Jackson (7), Roelly Winklaar (8), Toney Freeman (9), Ben Pakulski (10), Sergey Shelestov (11), Fouad Abiad (12), Essa Obold (13), Robert Piotrkowicz (14). Also included, the first-ever Bikini International, won by the young and beautiful Nicole Nagrani over 15 other great competitors! Ceremonies, speeches, presentations by Arnold Schwarzenegger and a tribue to Lou Ferrigno round out the contents of this great show. 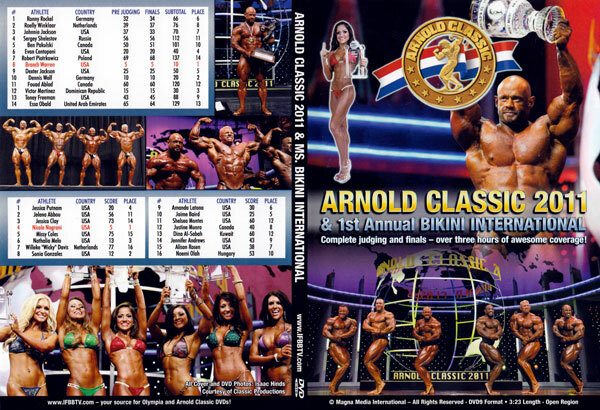 Includes the COMPLETE PREJUDGING & FINALS for both the Arnold Classic and the First Ever Bikini International. The complete ARNOLD CLASSIC USA DVD COLLECTION.